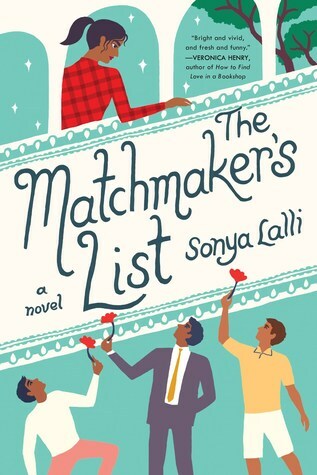 From Goodreads ~ Raina Anand may have finally given in to family pressure and agreed to let her grandmother play matchmaker, but that doesn't mean she has to like it - or that she has to play by the rules. Nani always took Raina's side when she tried to push past the traditional expectations of their tight-knit Indian-immigrant community but now she's ambushing Raina with a list of suitable bachelors. Is it too much to ask for a little space? Besides, what Nani doesn't know won't hurt her. When Raina's Indian mother was 16, she got pregnant by some white guy (Raina never knew who her father was). Her mother popped in and out of her life sporadically and she was raised by her mother's parents in Toronto. Raina has a demanding job in finance and owns her own condo. Her grandfather has since passed away and she is still close to Nani, her grandmother. Raina's best friend, Shay, is getting married soon and as Raina is now 29-years-old and unmarried, Nani feels it's time that she also find a husband. So she puts together a list of eligible men for Raina to date. Raina, though, is still love with Dev, a man she dated when she lived in London a couple years ago. Raina begrudgingly goes on the dates, which for various reasons there are no connections. Nani is able to keep coming up with more and more men who contact Raina for dates (and Raina should be freaking out more when she finds out how but she doesn't). Finally unable to handle it anymore, Raina lets Nani believe a lie which has the desired effect in having Nani back off. Around this time, Dev comes back into her life which, in addition to being part of Shay's upcoming wedding, adds even more pressure for Raina. For the most part, I liked this book and the writing style and look forward to reading others by this author. It is written in first person perspective in Raina's voice, though there are some chapters written in third person perspective which go back in time when Raina was younger. As a head's up, there is swearing. The author describes herself as a "romantic comedy" author. When the story started, I thought it was fairly light-hearted and it was funny reading about the dates ... but then it got heavy, which I wasn't expecting, and I didn't find the book in general romantic or a comedy. I found it odd that Raina would let herself get pushed so much around by her grandmother. Granted I'm not Indian so don't understand the pressures of the culture but Raina is supposedly modern, educated and self-sufficient financially. Instead of standing up for herself, she was wimpy and lied. I did find it interesting, though, learning about the Indian culture and its expectations. I found Nani at times funny and caring but other times she is bossy, manipulative and not likable at all. There's nothing nice to say about her best friend who is also Shay's mother. I don't know why Raina was hung up on Dev as it sounds like he treated her like crap, even when they were together. He was very self-centered ... it was all about him, his job and his phone ... yet two years after they broke up, she's still hoping they will get back together. Really? There seems to be a happy ending and it comes together rather quickly.